Brad Carmack, director and secretary of the Mormon Transhumanist Association, represented the Mormon Transhumanist Association at the 87th Annual Meeting of the American Philosophical Society in San Francisco on 27-31 March 2013. Brad spoke on the subject of "Transfigurism: a Syncretization of Mormonism and Transhumanism". His thesis was that emerging technology will continue to affect the evolution of religion, and Mormon Transhumanism is an early example of some of the adaptations we might expect to observe more broadly going forward. In the video recording, Brad speaks from 1:38:56 to 1:50:48 and participates in the panel discussion beginning at 2:04:40. Please find the playlist of all 26 video proceedings here! Videos of presentations at the 2013 Mormon Transhumanist Association Conference held in SLC, Utah on 5 April will be available in the next few weeks, and will be announced in this news feed. Like last year, the videos will be posted as a playlist on the Association's YouTube channel. The Mormon Transhumanist Association invites members and friends to participate in some casual after-conference activities in Salt Lake City on Saturday 6 April. 9am meet outside west doors of the Joseph Smith Memorial Building at 15 E South Temple in Salt Lake City. Video and audio of the 2013 Conference of the Mormon Transhumanist Association will be streamed to the home page of the Transfigurism.org website, live from the Salt Lake City Public Library tomorrow, 5 April 2013 from 9:30am to 5:45pm mountain time (MST) with a 30 minute break from 12:36pm to 1:06pm -- see the final schedule announcement for more details. Online chat will be available for viewers to comment and send questions. The association invites viewers and conference attendees posting about the conference on social networks to use the #mtaconf hashtag. Speakers will address the themes of Mormonism, Transhumanism and Transfigurism, with particular attention to topics at the intersection of technology, spirituality, science and religion. Previous conferences sponsored by the Mormon Transhumanist Association include the 2012 conference of the Mormon Transhumanist Association, the 2010 Transhumanism and Spirituality conference, and the 2009 Mormonism and Engineering conference. Keynote speakers will be Aubrey de Grey and Richard Bushman. Special guests Carl Teichrib and Peter Wicks will offer critiques of religious Transhumanism. Other speakers will include association members and leadership. If you can attend in person, register now! 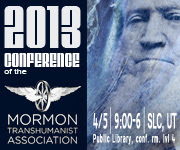 The Mormon Transhumanist Association is pleased to announce the final schedule for our 2013 Conference, which will be held tomorrow, 5 April 2013 from 9:00am to 5:45pm in Salt Lake City, Utah, in the level four conference room of the Salt Lake City Public Library. Speakers will address the themes of Mormonism, Transhumanism and Transfigurism, with particular attention to topics at the intersection of technology, spirituality, science and religion. Previous conferences sponsored by the Mormon Transhumanist Association include the 2012 conference of the Mormon Transhumanist Association, the 2010 Transhumanism and Spirituality conference, and the 2009 Mormonism and Engineering conference. Keynote speakers will be Aubrey de Grey and Richard Bushman. Special guests Carl Teichrib and Peter Wicks will offer critiques of religious Transhumanism. Other speakers will include association members and leadership. The conference is open to the public. Register now! Food is free for registered attendees. Admission is free with no requirement to purchase food. Food is $17.99 for meat and salad bar, or $12.99 for salad bar only.